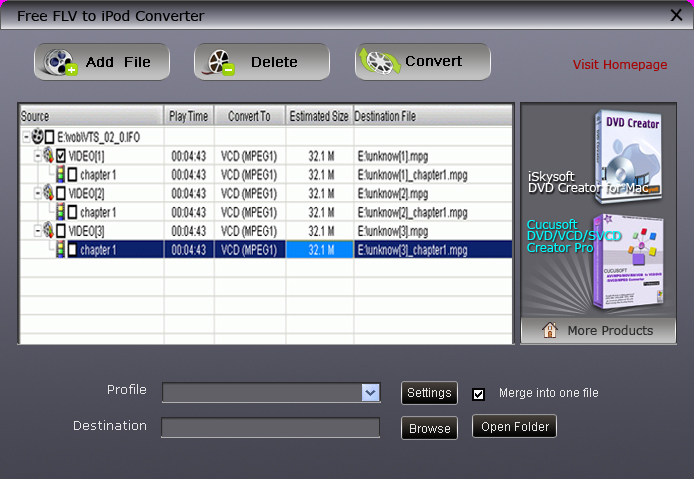 Free FLV to iPod Converter has a number of predefined settings (profiles) specially designed for novice users. While more advanced users can customize video and audio encoding parameters used by encoder: ???Resolution?? ?, Video Bitrate, Frame Rate, Audio Channels, Sample Rate, etc. In addition,you can merge severtal flv files into one output file. So powerful in function, so easy in use and so fast in speed!Just completely free ! 1?? ?Merge files into one If you want to merge the selected contents into one file, you can check the ?? ?Merge into one file??? option. As default the merged file is named after the first selected file (either a title or a chapter). 2?? ?Powerful and Completely Free FLV to iPhone Converter Free FLV to iPod Converter is a powerful and versatile flv to ipod converter which can convert FLV to iPod video,and convert FLV to MP4,MOV,MPEG-4,H.264 , M4A , MP3 , AAC with fast speed and high quality ! Free FLV to iPod Converter has luxuriant output formats to fit various multimedia devices including iPod Touch , iPod Nano , iPhone , Apple TV ,MP4 Player ,MP3 Player . You can also share favorite videos on QuickTime with this FLV to iPod Converter. 3?? ?Setting output video and audio parameters Detailed video and audio settings are provided by this Free FLV to iPod Converter for you to adjust, such as ???Resolution?? ?, Video Bitrate, Frame Rate, Audio Channels, Sample Rate, etc. 4?? ?Easy-to-use Only a few clicks to complete the conversion with supervising the whole process on real time. 5?? ?Fast speed and high quality Its drastic speed and the ease in use of its interface make this free FLV to iPod Converter remarkable.